Cell Structure and Function adheres to the principles and guidelines of the Committee on Publication Ethics (COPE). 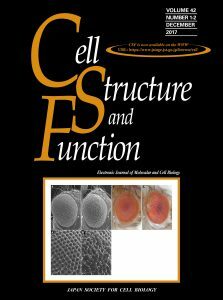 Cell Structure and Function is a biannual journal publishing significant and original contributions in all areas of molecular and cell biology. The journal welcomes the submission of Full Articles, Short Communications, Mini-reviews and Reviews, Technical Notes and Perspectives, all of which undergo single-blind peer review. The official journal of the Japan Society for Cell Biology, Cell Structure and Function is published exclusively in English and has an international readership. Objective and impartial reviews are central to a rigorous and robust peer review process. A conflict of interest exists when there are actual, perceived or potential circumstances that could influence a reviewer’s ability to act impartially. having seen or commented on drafts of the manuscript. If you believe there is the potential for a conflict of interest with a manuscript you are reviewing, please contact the Editorial Office as soon as possible. Efficient peer review and rapid editorial decisions are important to Cell Structure and Function. Reviews should be completed within 14 days. If you believe that you cannot submit your review by the deadline, please let the Editorial Office know as soon as possible. This allows us to keep authors informed and to make alternate arrangements if necessary. if you need to consult colleagues about the manuscript (either within or outside your own research group), please check with the Editor first to avoid inadvertently violating confidentiality or impartiality. Collaborating with PhD students or post-docs on peer review is an important training exercise that helps to bolster their experience and expertise. However, involving others in your review has the potential to violate the confidentiality of the review process. If you involve PhD students or post-docs in the evaluation of the manuscript, inform them of these guidelines and let the Editor know their full names and positions. Remember that the reviewer who was initially invited to perform the review is ultimately responsible for its quality and accuracy. It is Cell Structure and Function policy to keep reviewers’ names confidential. Journal staff will not disclose a reviewer’s identity unless the reviewer specifically requests such disclosure. A good review is clear, concise and constructive. It highlights a manuscript’s contribution to the field and outlines how it might be improved. If a manuscript is not publishable, a good review explains why its flaws are fatal. Reviews are separated into three parts in ScholarOne: multiple-choice questions, comments to the author(s), and comments to the Editor. These questions concern your recommendation on the manuscript’s publication based on its overall quality, as well as your recommendation on the CSF Award. Only the Editor sees the answers to these questions; they are not shared with the author(s). The reviewer’s report has two main functions. First, it provides the Editor with sufficient information to reach a decision on the suitability of the manuscript for publication in Cell Structure and Function. Setting out clear arguments for or against publication is more helpful than simply stating your recommendation to accept or reject the manuscript. Second, the review provides authors with feedback on their manuscript and, if necessary, advice on how to strengthen it. the clarity and quality of written presentation. numbered comments that address specific criticisms about the manuscript. Any criticism should be constructive, and should be directed at the research, not the researchers. Where possible, provide evidence to support assertions of fact. Is the relevance of the work clearly identified in the Abstract and Introduction? Does the Introduction place the work into context and present hypotheses clearly? Are the methods appropriate and explained fully? Are any statistical analyses appropriate and correctly applied? Have the methods been described sufficiently to allow replication? Are any caveats or limitations clearly explained and/or mitigated? In the case of human/animal experimentation, have the authors adhered to established codes of practice and ethics? Are the results clearly and adequately explained? Are the tables and figures easily interpretable and necessary? Have the authors considered any alternative explanations for their results? Have the authors made unsupported claims or inappropriate speculations? Have any of the data or conclusions been published previously? Have the authors cited relevant literature? Do the title and abstract accurately reflect the main findings of the manuscript? Are there any errors in methods, facts, calculations or interpretations? You should refrain from making a recommendation on publication in this section, as the Editor’s decision may be based on conflicting reviews. any concerns you may have about potential ethical violations in either the research or the manuscript. Reviewers should submit their reviews to the journal’s ScholarOne site using the link provided in the Editor’s invitation email. An online Help Guide is available to assist you in using the system. If you encounter any difficulties, please contact the Editorial Office. Keep a copy of your review. If you recommended revision, the Editor may invite you to comment on the manuscript when it has been revised. When the Editor makes a final decision on the manuscript, you will receive a copy of the decision letter along with all reviewers’ comments to the authors. Reviewers’ identities remain confidential unless a reviewer has signed their review.